On October 21, 1949, the Government Administrative Council (the Cabinet) of the Central People's Government of the People's Republic of China was established. Zhou Enlai, the first premier of the Administration Council, chaired the first cabinet meeting. Picture taken on October 21, 1949 when the Economy Committee of the Government Administrative Council was established. In the front line sits Director Chen Yun (6th from left), Vice Director Bo Yibo (5th from left) and Vice Director Ma Yinchu (7th from left). On October 1, 1949, Mao Zedong declared the formation of the People's Republic of China at the Tian'anmen Rostrum. 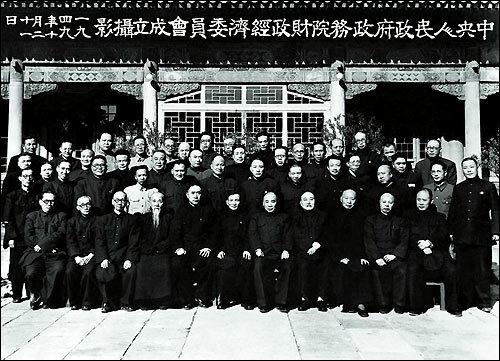 In September 1954, according to the Constitution that was passed at the first National People's Congress, the Administration Council was renamed as State Council.